You are here: Home / Media Reviews / Spider-Man: Into the Spider-Verse * A Masterpiece of the Superhero and Animated Genre! Miles Morales comes across the long-dead Peter Parker. This Peter Parker is not from his world though; he’s from somewhere else in the multi-verse. With Parker’s guidance, Miles will become Spider-Man: and through that he will become part of the ever-expanding ‘Spider-Verse.’ KIDS FIRST! Film Critic Nathalia J. comments, “The film is extremely colorful, unique and full of visual 3D animation. The film certainly embraces the comic book style, which I really enjoyed. It definitely feels authentic.” Arjun N. adds, “Spider-Man: Into the Spider-Verse is a masterpiece of the superhero and animated genre. Groundbreaking animation and voice talent propel this above any other Spidey movies. Any fan of Marvel or even animation must check out this one-of-a-kind experience.” Sahiba K. chimes in with, “Spider-Man: Into the Spider-Verse surprised me in its ability to create an original piece despite the several renditions of Spider-Man that exist! …The animation sets a milestone in the history of animation, for it is the first of its kind. Such aspects bring fresh artistry in animation that is rare in the film industry.” Zoe C. wraps it with, “From the very beginning, Spider-Man: Into the Spicer-Verse is very energetic and captures your attention. This animated film has impressive visuals. The music creates a fantastic rhythm. And you just want to watch more.” See their full reviews below. This American computer-animated superhero film follows Miles Morales who must juggle his high school life with his status as a superhero as he is introduced to the “Spider-Verse,” where there can be more than just one Spider-Man. Miles Morales comes across the long-dead Peter Parker. Peter Parker is not from his world though. He is from somewhere else in the multi-verse. With the help from Parker, Miles will become Spider-Man. The story follows Brooklyn teen Miles Morales (Shameik Moore) or the “new Spider-Man,” after he is bitten by a radioactive spider. When Peter Parker, the original Spider-Man, dies, Morales realizes he is the only one left to save the city from the grips of Kingpin (Liev Schreiber). Kingpin threatens to risk all space-time continuums, which even brings new Spider-men from other dimensions and timelines. One such is another Peter Parker (Jake Johnston) who serves as Miles’ mentor. These Spider-men remain the only ones powerful enough to defeat Fisk and his maniacal experiments. Shameik Moore, as Miles Morales, is easily the movie’s best character and empowers in what is the first depiction of his character in a movie. His coming-of-age brings upmost relatability and his perseverance only makes his origin story as compelling, if not more so as Peter’s. Jake Johnston, as Peter Parker, portrays the classic original well, but with neat nuances. His character is one that has suffered many setbacks and devolved to laziness, with his arc being a fun, unexpected diversion. Bryan Tyree Henry, as Jefferson Davis, charges his father-son relationship with much heart as he struggles to bond. His brother Aaron, played by Mahershala Ali, provides another compelling performance, as he remains a key inspiration for why Miles is who he is. 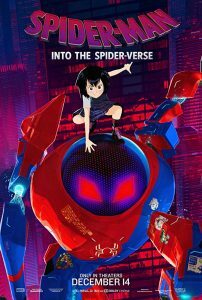 The Spider-verse, is complemented by the mysterious Gwen Stacy (Hailee Steinfeld), anime-inspired Peni Parker (Kimiko Glenn), Nicolas Cage who shines as the Spider-Man Noir and last, but not least, the wise-cracking anthropomorphic Spider-Ham (John Mullaney). Liev Schreiber brings a deep booming voice in the Kingpin that only adds to his menacing large physique. Bob Persichetti, Peter Ramsey and Rodney Rothman are experts in their class with many beautiful and visceral shots commanding the plot. The animation is something to be commended with its own identity taking homage from many comic books. My favorite scene comes from the central scene where Miles becomes one with his powers, as every shot has meaning and flair. It is truly inspiring and mind-blowing from a plot-driven and animated perspective. I could nitpick on the lack of a compelling villain at points or even some very infrequent awkward song placements, but in the end, everything comes into fruition and those are a long gone afterthought. Spider-Man: Into the Spider-Verse surprised me in its ability to create an original piece despite the several renditions of Spider-Man that exist! Spider-Man has been adopted by several films and TV shows in the past decades, yet Into the Spider-Verse is the most creative take on Spider-Man. The animation sets a milestone in the history of animation, for it is the first of its kind. Such aspects bring fresh artistry in animation that is rare in the film industry. The story follows Miles Morales, a young boy who faces pressure at high school and at home to be the best. However, when a portal to the multi-verse is opened, Miles is tasked with the responsibility of saving his hometown of Brooklyn. Along the way, several Spider-Men and Women meet who align with Miles and they become a close and loving family. The animation is contemporary and avant-garde, featuring pop art and street art. It is a tribute to the art of comic books, bringing them to life. It has several aspects of a comic book including onomatopoeia like “Pow!” and “Boom!” that are surrounded by colorful borders in several of the action scenes. Another example of the comic book charm occurs when an exciting fight move is taken by one of the Spider characters. At this time the screen splits into three, displaying the happenings in that instant, and adding to the thrill of the moment and overall fight. These small nuances accumulate, making me feel as if I had walked into a comic book. My favorite part is the way that there are small tributes to the original Spider-Man comic books with different takes on villains such as Dr. Octopus and the Green Goblin. They even made small references to the Marvel Cinematic Universe films that added to the ingenuity and display the directors’ attention to detail. The only thing that the film can improve on is the plot, because some of the characters are underdeveloped. Otherwise, the climax and storylines are unpredictable and engaging. The message of Spider-Man: Into the Spider-Verse is that all it takes to be what you want and do what you want is to take a leap of faith. I give this film 4.5 out of 5 stars and recommend it for ages 7 to 18. Be sure to check out Spider-Man: Into the Spider-Verse in theatres nationwide December 14, 2018. What would you do if you could be a superhero? What if you have no choice? From the very beginning, Spider-Man: Into the Spicer-Verse is very energetic and captures your attention. This animated film has impressive visuals. The music creates a fantastic rhythm. And you just want to watch more. With this film, Marvel has created a film that celebrates comics, film and visual arts. Of course, it celebrates Spider-Man and makes this superhero relevant and contemporary. It is absolutely eye-poppingly beautiful and really pushes the boundaries of the genre with its colors, textures and camera movements. There are several different forms of animation in one film. You feel as if you are actually reading a comic book or the comic book is coming to life. With great power comes great responsibility and we all can be heroes. This is the idea behind Spider-Man: Into the Spider-Verse – inclusion for all in the vast universe and the idea that we can all be heroes by making the right choices and doing our best helping each other in our everyday life. This film opens nationwide December 14, 2018 at a theater near you. Be sure to check it out. Photos © Sony Pictures Entertainment Inc. Animation. All rights Reserved. For Promotional use only.